ESCO are proud to be part of another major Hospital redevelopment delivered by the NSW Government. The second stage of St George Illawarra Hospital’s redevelopment is nearing completion, with the new eight-level Acute Services Building due to admit its first patients during the last week of October. Originally scheduled for completion in early 2018, the redevelopment was fast tracked 6 months to come in $30 million under budget. The now $277 million investment was announced by the NSW Government in February 2015 following the completion of a $41 million Emergency Department. The Acute Services Building will sit atop the 24 hour operational ED, and be the centrepiece of the hospital’s extensive upgrades. 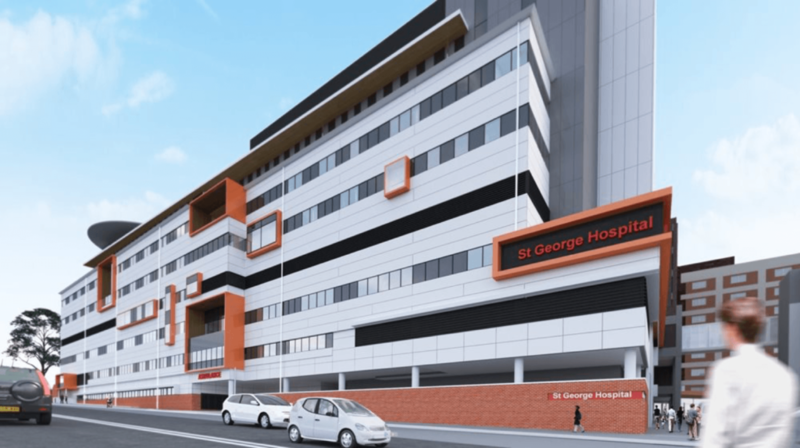 Additions to the new eight storey facility have aimed to accommodate St George’s swelling and aging population by providing efficient and effective healthcare to the region. A High Dependency Unit will be unveiled, while the new Cardiac Intensive Care Unit will feature two Cardiac Catheter Laboratories. Intensive Care and High Dependency Departments, along with eight new operating theatres will bring a total of 128 new inpatient beds. Now the tallest building in Kogarah, staff and patients will migrate to the Gray St premises over the coming months.